Brace yourself: Sharp's dashing looking LT-32P70E is not HD Ready. But, Sharp sees the LT-32P70E's non-HD Ready status as a potential strength. 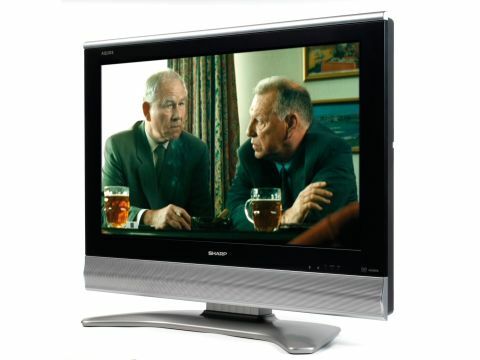 A low native resolution of 960 x 540 pixels means the LT-32P70E is set up for standard definition PAL broadcasts, as it can show them without the need for noise-inducing scaling. Connectivity gets the job done. Pleasingly, although it's optimised for standard definition, the set can take HD through an HDMI socket or component video-compatible VGA PC jack (the necessary component-to-VGA cable is provided). Plus it carries two Scarts, and the usual 'lower quality' options. The LT-32P70E is also equipped with a digital tuner, complete with seven-day EPG support and an eight-event timer memory. Reasonably accessible onscreen menus, meanwhile, play host to one or two interesting features, including selectable progressive and interlaced modes, noise reduction routines, and a contrast booster. The LT-32P70E has won an Energy Saving Recommended Endorsement from the Energy Saving Trust for its low power consumption. So you can be eco-friendly and save money. Given its pro-PAL stance, we tried the LT-32P70E first with the standard-def test DVD of Layer Cake and found ourselves seriously impressed. For starters, as billed the standard-def picture is very clean and pure, with hardly a trace of dot crawl noise. The set also does unusually well suppressing MPEG noise from the digital tuner, and enjoys some winningly vibrant hues together and a deft touch with colour subtleties. The tone is natural for most of the time, too, with just the occasional over-ripe skin tone to disappoint. The TV's black levels are good with SD and HD alike. They're not absolutely the deepest in the world, but they nonetheless get black enough to give dark scenes a solid sense of depth and scale. Perhaps inevitably, though, all this SD finery has a trade off with HD. Our Layer Cake HD recording from Sky simply doesn't look as sharp or detailed as it does with our other group test contenders. The TV downscales all that lovely HD detail to fit its 540-line panel. The downscaling of the HD picture also seems to generate a little extra video noise. The LT-32P70E's sound, meanwhile, puts in quite a punchy performance with the Layer Cake soundtrack, providing power, treble richness and a wide soundstage. A touch more bass would have really sealed the deal, though. As a TV targeted at standard definition, it would have been nice to find the LT-32P70E costing a bit less. But still, if HD is as interesting to you as watching paint dry, and you'd much rather enjoy a mostly stunning standard definition performance, the LT-32P70E fits the bill.